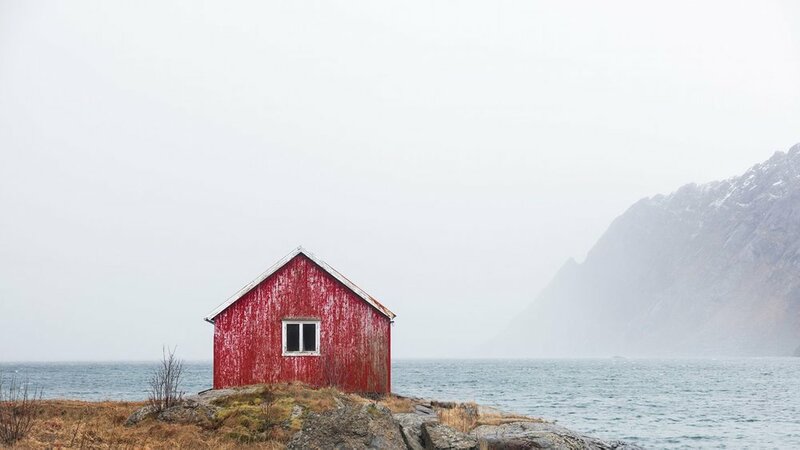 Join us as we take on the Lofoten Islands dressed in autumn colors. During this tour, we will make sure you have the best possible chance to experience the good light, included the aurora borealis aka the northern lights. You will be in good hands when you join the northern lights expert Tor-Ivar Næss and the enthusiastic landscape photographer and YouTuber Mads Peter Iversen. The combination of local knowledge and photography expertise will take your photography skills to the next level when joining this nordic duo! The full price of this tour is 2990 euros and is due 60 days prior to the tour. Paying it all at once, or the deposit of €800 will reserve your spot at this tour. If you want your own room, that is an additonal €500. This workshop includes dinners served by local professionals at Hattvika Lodge! We do accept all major credit cards. Transport from and to Harstad/Narvik Airport Evenes (EVE), accommodation at Hattvika Lodge for the duration of the workshop, photography guiding both in the field and also post-processing session at Hattvika. Dinners served by the local chef at Hattvika - It´s hard to beat the value of a good meal together with the gang after a day of shooting. Dinners are included - other meals are not, but rest assured there will be plenty of chances to buy groceries and prepared meals during this workshop. We will plan it so we can eat some meals together. Also not included are any private insurances and any costs required to travel to and from Harstad/Narvik Airport Evenes (EVE) from to to your home location. Join us on this week long adventure in the picturesque Lofoten Islands. The region will be dressed in the fiery colors of autumn and with a bit of luck, we get to see the green gold, the northern lights. We will spend this week exploring the many world-class locations the region has to offer. With a base at the Hattvika Lodges, we are accommodated in the heart of Lofoten - giving us access to the amazing location with ease. The lodge at Hattvika balances the feeling of luxury and living at sea lodge perfectly. You will be amazed! We will pick you up at Harstad/Narvik Airport, Evenes, and take you and the rest of the eager photographers to Hattvika Lodge, where we will start off with a proper meet & greet. At this point, you will get to know us a bit better as well as the other participants over a nice meal. During this week you will get courses in night photography specifically oriented towards capturing the northern lights aka the aurora borealis. We will tutor in our ways of post-processing as well and in-field techniques such as focus stacking, blending exposures and shooting for dynamic range. The workshop is suitable for all levels of photographers - we just expect that you enjoy being outside in any weather if needed. 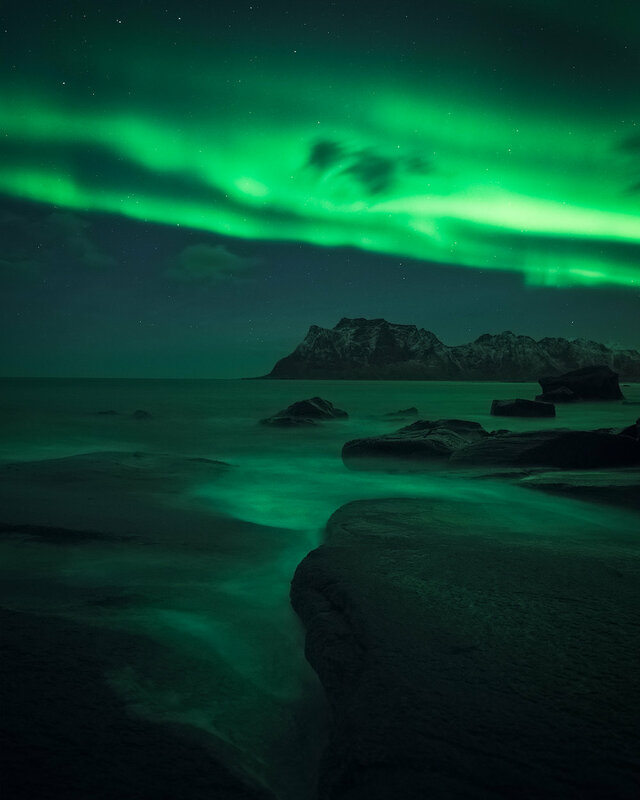 The Lofoten Islands will most likely show us many sides when it comes to weather, but this is also the gateway to beautiful and unique images. It might be wet and cold, but we will most likely not experience snowfall during this week - this is more common later in the year in Northern Norway. 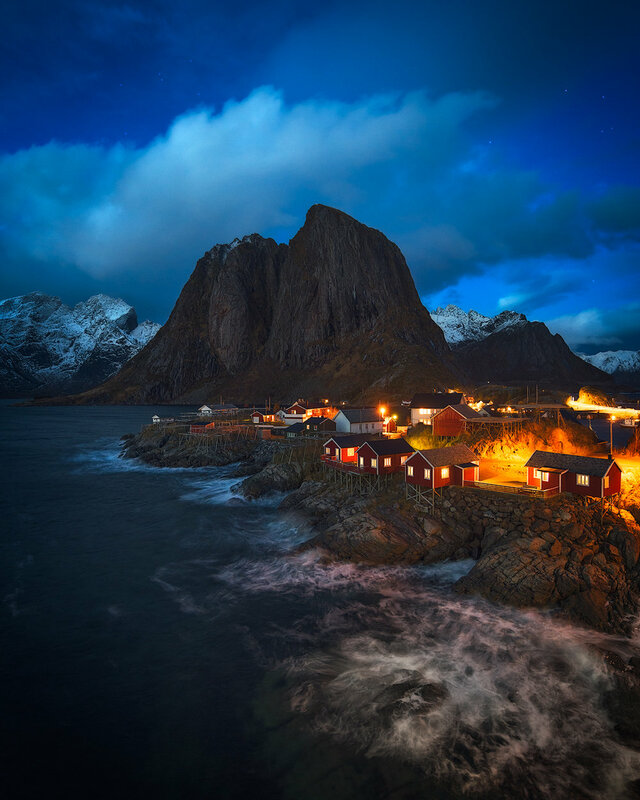 Lofoten is an archipelago famous for its dramatic scenery. A string of islands is connected by road, bridges, and tunnels. In each of these islands, you will find picturesque villages and hidden beaches. In total, the region has a population of about 24500. Our base camp will be at the heart of Lofoten, at the beautiful Hattvika Lodge in the small town of Ballstad. How to get to the meeting point? The quickest way to get to the meeting point at Harstad/Narvik Evenes airport (EVE) is via Oslo Airport Gardermoen (OSL). Domestic flights in Norway can be purchased from SAS and Norwegian. Should you need to come in the day before, we recommend you staying with Tjelsundbrua Hotel. "You’ll never forget your first approach to the Lofoten Islands. The islands spread their tall, craggy physique against the sky like some spiky sea dragon, and you wonder how human beings eke out a living in such seemingly inhospitable surroundings. The beauty of this place is simply staggering." You should bring a camera you are comfortable using. We recommend you to bring a camera with full manual control as well as interchangeable lenses. We will be photographing a variety of locations, so having a selection of lenses to chose from is nice. For northern lights it is highly recommended to have a fast ultrawide angle lens. Tor-Ivar & Mads always brings his 14-24mm, 24-70 and 70-200mm. The lens selection will vary by brand, but our selection gives you an idea of what you can expect to be using. Since part of this tour is about capturing the night sky as well, you will need a sturdy tripod to be able to do long exposures or just being able to cope with a gust of wind. You can lend one from us, but we need to know in well in advance. Filters are optional but recommended. A laptop with the latest version of Adobe Lightroom and Photoshop is highly recommended. When we´re shooting at night, you will need a headlamp as well. Extras like batteries, memory cards, and lens cloth are also highly recommended. The weather can change very fast in the Lofoten Islands, so proper outdoor clothing is necessary. Being able to protect ourselves from the elements is key to a successful workshop. A good set of base layers, mid-layers for warmth such as fleece and down. A shell jacket and quick-dry hiking pants will help to protect against the elements as well. Insulated hiking boots are advised. Having a warm hat and gloves is essential. We will prioritize catching that dramatic light, so we will be on the move for sunrises, sunsets and of course the northern lights. The weather in the Lofoten Islands is highly unpredictable, so we will have to adapt as we go. You can, however, rest assured that we will visit amazing locations up to several times per day! We will visit location stretching from Svolvær in the north to Å in the south. Payment: €2990 Based on double occupancy. You will be sharing the room with someone of your gender, unless anything else is agreed upon. Single room is €500 extra. The deposit is €800. All payments are done via Invoice or our online booking system. The deposit is non-refundable and full payment is due 60 days prior to the tour. Arrival: Harstad/Narvik Airport, Evenes (EVE). September 27th, no later than 11am. Departure: Harstad/Narvik Airport, Evenes (EVE). October 4th, after 11am.